Season Four Rebecca faces the music for her actions. Crazy excited! Crazy Ex-Girlfriend is renewed for Season 4 on The CW! Season Four is the final season of theThe CW's musical comedy show "Crazy Ex-Girlfriend". Co-creators Aline Brosh McKenna and Rachel Bloom envisioned this as the final arc in the four-part story . The Season Four renewal was officially announced on April 2, 2018 . The 18-episode final season premiered on October 12, 2018. The official series finale ("I'm In Love") aired on April 5, 2019 followed immediately by the eighteenth episode which was a concert special. On April 2, 2018 Crazy Ex-Girlfriend was reported as having been renewed on several media outlets such as Deadline  and Variety . Co-creator Rachel Bloom reiterated that Season Four would be the end of the show and narratively conclude the story arc started in Season One . While the two previous seasons saw the episode count reduced to 13 five more episodes were added for a total of 18 in Season Four . On August 1 Rachel Bloom announced on her Instagram account  that co-creator Aline Brosh McKenna would be the first guest star on the show. Actor/comedian Patton Oswalt revealed his return to the show after a brief cameo in Season Two. According to a tweet he posted  he will be performing a musical number this time. Another returning character is Brody (played by Benjamin Seimon) who was confirmed in a TV Line interview with McKenna and Bloom . On May 21, 2018 Rachel Bloom announced on her Instagram  that the writers room was open and production officially started on Season Four. The staff consists of co-creators Bloom and Aline Brosh McKenna with returning writers Dan Gregor and Doug Mand, Sono Patel, Rene Gube, Michael Hitchcock, Rachel Specter and Audrey Wauchope, Elisabeth Kiernan Averick, Erin Ehrlich, Jack Dolgen and Ilana Peña. McKenna also announced via her Twitter account the names of female directors who would be working on the show. This included herself, the return of Erin Erlich and Jude Weng, debuting directors Audrey Wauchope with Rachel Specter, Rachel Bloom and Carrie Brownstein . On July 25, a screenshot of the script for the first episode was posted on Instagram . The title was revealed to be “I Want To Be Here” and follows the tradition of specific naming conventions for the series episodes. Unlike previous seasons the title has word “I” in the place of a male love interest name and there is a lack of punctuation. A “cell block tango number” has been confirmed by Rachel Bloom in an interview with TV Line . 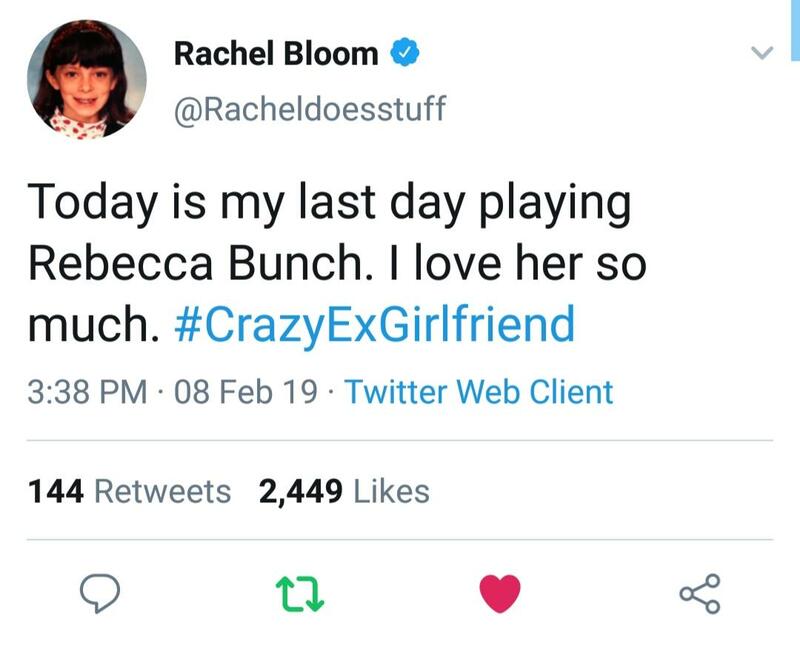 On January 3, 2019 Aline Brosch Mckenna tweeted out a photo of herself and Rachel Bloom along with the message they were in the process of writing the series finale. In a breaking the fourth wall moment it was mentioned in the ninth episode "I'm Not The Person I Used To Be" that the finale will take place on Valentine's Day. However, offal press releases indicate that the finale will actually air on April 5 followed by a live concert. On January 25, 2019, Rene Gube uploaded a photo of the final table read on his Instagram account. The last day of filming was on February 8 as tweeted by Rachel Bloom. A wrap party happened the next day as documented by photos uploaded on the SnapBar. Rachel and Aline writing the series finale. In "I Have To Get Out" when Rebecca checks her phone it says that it's January 9th. In "I Have a Date Tonight", it is said that Rebecca has to make a decision until next Thursday, which is Valentine's day. The episode "I'm In Love" sets on Valentine's day, exactly a year after Rebecca makes her decision. ↑ Fontana to play "Tootsie"